For more than six decades, Vaughan Constructions has been influencing the landscape of Australian architecture and building history. Renowned as one of Australia’s most respected industrial and commercial builders, Vaughan’s approach is to focus on building customers for life. Two of every three projects we develop in fact are from returning clients; this success rate validating our approach to what we do. Established in 1955, Vaughan Constructions is one of the most reputable and trusted companies in commercial, retail, residential and industrial construction and is widely considered to be an industry leader in both innovation and sustainability. Vaughan's portfolio includes some of the largest structures in the Southern Hemisphere. We service Australia wide, with licensed and experienced commercial builders in Melbourne, Sydney, Adelaide, Perth and Darwin. Whilst design and construction is our specialty, we are also widely recognised for our versatility where we work with clients on build-only contracts. Vaughan's approach and commitment to our clients enables us to be predictable. Our clients receive value, quality and certainty. In addition to our industrial building expertise, Vaughan's capabilities also extend to offering property development experience to your team. We independently manage significant land holdings and are able to act as an advisor in all aspects of your land transaction. 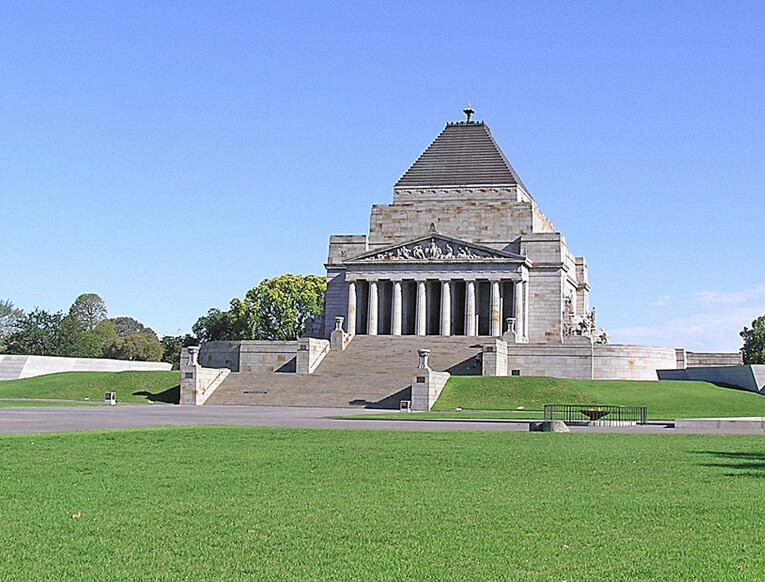 Pictured is the Shrine of Remembrance built in conjunction with the Lodge Brothers. Get the most efficient design and build at the most economic cost through Vaughan’s advanced planning of site selection, site layouts and budget estimation. This helps you avoid unnecessary design changes and unwanted blowouts during construction. Vaughan’s design team delivers creative and innovative solutions that are created just for your business. Aesthetic and structural considerations are balanced to give beautiful outcomes while ensuring it remains functionally efficient and is of high investment grade. We guarantee the contracted completion date and budget of your project by maintaining constant project supervision and ongoing communication with our clients to adhere to agreed design and construction schedules. We have created a cost database from up-to-date and relevant data, so we can give you accurate project budgets and feasibility studies. This allows us to give you a detailed, reliable forecast of construction costs for any sized project, from design to build. Vaughan Constructions finds sites to suit your project perfectly and can advise on all aspects of site selection, town planning, zoning requirements and services availability. This minimises planning delays, reduces design and construction costs, and ensures your project gets off to the best start possible. Vaughans will assess your needs to determine whether a pre-lease facility will provide a more viable, low-risk option for your business and after considering the advantages and disadvantages of a number of locations, will package a lease to best suit your requirements. Save your company considerable time and expense by engaging Vaughans to structure a complete land and building package. Choose from a range of locations for a variety of purposes, from data centre construction to office block development and much more. Vaughans will provide advice as to how you can maximise use of your existing site as well as accommodate for future growth whilst minimising disruption to your business during construction. Vaughans offers the flexibility of providing either a development management agreement or joint venture arrangement to manage the development of your land, from empty paddock to finished product.